Prof. C.K. Raju in Cape Town South Africa on Decolonizing the hard sciences. His talk at Kwazulu-Natal is here. Here are the sildes of a lecture on decolonizing mathematics that Raju gave in Amsterdam: http://ckraju.net/papers/presentations/critical-collective.pdf. The lecture and discussing in Amsterdam is here. Dialogo Global, a Center of Study and Investigation for Decolonial Dialogues, is a non-profit and non-governmental organization promoting research, knowledge-making, education. Dialogo Global organizes two Summer Schools in Spain. In Barcelona the Summer School is on “Decolonizing Knowledge and Power”. The Summer Schools looks into questions of epistemology, activism, decolonizing the mind and power. In Granada the Summer School is on Critical Muslim Studies: Decolonial Struggles and Liberation Theologies. Critical Muslim Studies is inspired by a need for opening up a space for intellectually rigorous and socially committed explorations between decolonial thinking and studies of Muslims, Islam and the Islamicate. Critical Muslim Studies does not take Islam as only a spiritual tradition, or a civilization, but also as a possibility of a decolonial epistemic perspective that suggests contributions and responses to the problems facing humankind today. It offers an opportunity to interpret and understand Muslim phenomena in ways that does not reproduce Eurocentrism, Islamophobia or takfiri exclusivism. Houria Bouteldja is a French-Algerian political activist and writer focusing on anti-racism, anti-imperialism, and Islamophobia. She serves as spokesperson for the Parti des Indigènes de la République (Party of the Indigenous of the Republic), a member organization of the Decolonial International Network (DIN). Houria has published a book in French titled: Les Blancs, les Juifs et nous: vers une politique de l’amour révolutionnaire. It is now translated in English and will be published at MIT press in November 2017 under the title: Whites, Jews, and Us – Toward a Politics of Revolutionary Love. Cornel West, philosophy professor at Harvard and Princeton, public intellectual and activist, wrote a preface. This is the preface. 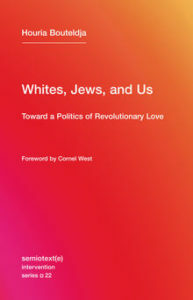 This book is a courageous and controversial act of revolutionary love. Houria Bouteldja’s bold and critical challenge to all of us—especially those who claim to be leftists or progressives—builds on the rich legacies of Malcolm X, Jean Genet, Aimé Césaire, Audre Lorde, James Baldwin, Frantz Fanon, and Chela Sandoval. This challenge consists of a powerful intellectual case against imperial innocence and a poignant cry of the heart for an indigenous revolutionary politics—a politics that is unapologetically anti-patriarchal, anti-capitalist, and anti-imperialist grounded in the doings and sufferings of colonized peoples. It comes as no surprise that our present moment of escalating neo-fascist regimes, tightening patriarchal practices and neoliberal free-market ideologies have thrown the left and progressive voices into a panic. And such a panic makes it difficult to have a robust and painful dialogue about whiteness, Zionism, patriarchy, and empire. Does not the end of imperial innocence entail the rejection of social democracy or neoliberal politics—with their attendant “white good conscience,” top-down feminism, bourgeois multiculturalism, and refusal to target a vicious Israeli occupation of Palestinian lands and people? Do not the precious lives of hundreds of thousands of Muslims killed by U.S. and NATO Armed Forces (including immoral drone strikes) have any moral weight in how we understand the ugly forms of xenophobia spilling out of control in the US and Europe? What does a candid and compassionate indictment of Zionist practices on the West Band and Gaza look like that avoids anti-Jewish hatred and contempt? How does a “decolonizing internationalism” proceed in the face of entrenched nationalisms or neoliberal cosmopolitanism? Can a “decolonial feminism”—with its echoes from the work of the visionary bell hooks in the very belly of the US imperial beast—lead toward a “concrete emancipation” that resists patriarchal religions and elite feminisms? As the “genocides, ecodisasters, and ethnocides” continue to surface, “wedded to new secular hierarchies,” either a new “great We of a decolonized majority” rooted in visions beyond empire, capitalism, whiteness, and patriarchy and grounded in a revolutionary love can guide us or we all succumb to the “ancient forces of human greed and violence.” These questions and issues demand the best of who we are—and none of us have a monopoly on the truth and justice they require and solicit. There is a genuine humility in this book—and its sense of urgency and dire emergency behooves us to wrestle with its rich contents. Louisa Yousfi is a decolonial journalist and activist. For the past 7 months she has been hosting the online broadcast Paroles d’honneur (https://www.youtube.com/channel/UCTth6-5ZiCD_CUJ6xOMug_w). First, would you mind tracing back the emergence of the show? The idea of this show emerged in a specific context; the presidential campaigns were coming up and we knew it would be painful as usual for postcolonial and poor neighborhood populations. We knew that the media mechanisms that frame the political discourse would prevent the rise of an autonomous voice that would take into account this special category of the population ; this of Blacks, Arabs, Muslims and poor neighborhood residents. This phenomenon engenders a situation that might be comical if It did not hold drastically negative consequences; while we are omnipresent in the media, endlessly debated in « expert » mouths as objects of study, of both fascination and repulsion, we are however never really present as producers of discourse and meaning. The presidential campaign is a time where these media processes become exacerbated, where the main TV channels struggle to hide the propaganda dimension of their editorial line. Some would debate it as the « Ideological apparatus of the State ». But it is a fact; we are the ever-absent members of the party, and absent people are always wrong. The show thus takes its origins from the activists of the « political antiracist » or decolonial movement, from journalists and intellectuals who chose to answer an ambitious challenge. They are striving to give visibility to this activist, political and social reality that blossoms, struggles, thinks and moves strategically forward within the French political space, while holding for sole media projection a deforming mirror that only mutes it or demonize it to discredit its existence. Yet we are convinced that we have often more to say about our dominant themes such as racism, imperialism, police violence than professionals of public speech, but also on a wider array of societal themes. That is why our slogan is « by us for all ». It makes a clear statement in regards to our lens on the history of the immigration struggles while targeting the rest of society that wishes to join or to be confronted to a new way to debate politics in France. In sum, it is a new form of radicalism, an opportunity to invent a new political space. That space materialized perfectly within that café called “La Colonie” where we film our shows, which was created by Franco-Algerian artist Kader Attia, himself acquainted with decolonial issues. That highly symbolic space was inaugurated on Oct. 17th 2016 in memory of the Algerian victims of Oct. 17th 1961. 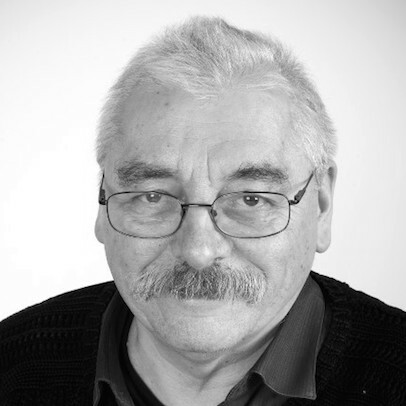 During the first and second round of the French elections, it quickly became a true “decolonial headquarter”; in other words a space where those who do not find resonance in the current political offer can hear about original and off the beaten track analyses, and openly react to issues that remain little debated. Close to 300 people were present during both electoral nights, and almost 50 000 others watched live the online videos we posted, demonstrating that we guessed right! Undoubtedly Paroles d’honneur answers a real need of thoughts reflection and confrontation in a respectful yet frank framework. Finally, I must admit having particular affection for this format that we call “Great debates”, in which I invite philosophers (Etienne Balibar, Tristan Garcia, Norman Ajari) to converse on issues at the crossroads of philosophy, politics and other human sciences. We have, among others, organized debates on “political dignity” or on “universalism”. These are beautiful high-level debates that have the capacity to bring another level of abstraction and intelligibility to social movements. This is certainly less accessible and less fitting to the general public, but not less important. This is where we are able to develop, enrich and experiment the intellectual production of postcolonial topics, in contact with other thoughts from a different political culture. Knowledge also entails a stake of power. We need to invest it without shame, to occupy all fields that produce meaning and systems of truth. In other words, at Paroles d’honneur, we are home everywhere! Why did you create a specific show instead of imposing decolonial issues into more “traditional” media? Because that space is a minefield for us! Traditional media mechanisms are so locked that the rare television appearances of those from our ranks are systematically set up as trials. Their arguments are either discredited on account of irrelevance because not fitting the national republican model, or they are required to defend themselves from a list of accusations made up for the occasion. They are almost never invited to contribute to the debate but rather turn into the popular scapegoat. For instance, I am thinking about the intervention of CCIF (Group against islamophobia) ex-president Marwan Muhammad on the stage of the Salut Les Terriens show. While he was officially invited to present his upcoming book, he was instead freely insulted by Lydia Guirous and Sonia Mabrouk. Let us contemplate in the meantime the orchestrated set up that consists in placing Arab women who represent the quintessence of integration to face an Arab man and unapologetically call him an islamist, a communautarist, a manipulator, etc. Have we even talked about the content of his book? Of course not! Same record for Houria Bouteldja and Maboula Soumahoro when they got invited on the stage of Ce soir ou Jamais. Thomas Guénolé did not engage any debate, he simply prevented any opportunity to do so by pouring down dishonest and preposterous accusations that hit the nail on the head to an audience little acquainted with decolonial theses. How do you make your voice heard in such conditions? That is why it is important for spaces like ours to exist in order to bring back meaning to debates. That being said, I completely respect those who have the courage to carry a different voice and remain uncompromising amidst traditional shows. It is an ambitious strategy that demonstrates a slight evolution of power dynamics into our favor, but which also seems insufficient to me if it is not accompanied by the appearance of new independent media such as Paroles d’honneur. What conclusions can you draw from this first season? A very positive result! On all accounts! First and foremost, I sincerely believe that few shows in France can praise themselves on such quality in terms of political content and in depth reflection. Guests who accepted to come to the show all brought an original, audacious and informed point of view. Among them you could find intellectuals, activists and artists such as Françoise Vergès, Farida Alamazani, Olivier Le Cour Grandmaison, Norman Ajari, Nacira Guénif, Na Boakye, Marwan Muhammad, Amal Bentousi, Danièle Obono, Ulysse Rabaté, Omar Slaouti, Étienne Balibar, Tristan Garcia, Laurent Lévy, Maboula Soumahoro, Michèle Sibony, Michelle Guerci, Stella Magliani-Belkacem, Patrick Simon etc. Besides, thanks to the format of the “QG” show that privileges free speech without time constraints -some shows lasted up to 3 hours-, guests were able to carry out their meaning to its conclusion and develop it without any presenter threatening them to turn off the microphone. The latter always mutilates the complexity of the discourse, and thus its richness and relevance. As far as I am concerned, I have always found exasperating that habit of TV hosts to systematically interrupt their guests when they are barely starting to develop their argument. “Time is running out”, yes, but we end up wondering what was the point of organizing a debate altogether if none of the guests was given enough time to explicit the argument they are there to make. I have thus tried to set up a more flexible, less conventional style but with an interactive dimension where members of the audience can intervene at any point and ask questions to our guests. It works a little like in the show Droit de reponse from Michel Polack, which brought fresh air into the French media landscape. The result is conclusive in many regards, but I am quite proud of what we were able to accomplish with so little means. Looking back, I would say that the first two “QG” shows were important because they offered a real visibility to the decolonial political field at a time where a true electoral catastrophe was taking place. But the following show entitled “Mélanchon est il notre pote?” (Is Mélanchon our friend?) came out as a real upgrade in quality. This is when we managed to come out from the “decolonial inner circle discourse”. This show was far from being consensual and allowed the expression of real political and strategic disagreements, mostly thanks to the presence of representatives of the “France insoumise” (unsubmissive France) movement such as Danièle Obono and Ulysse Rabaté, who had the courage to come defend their perspectives on a field where they knew they would not be done any favor. We wish to pursue our mission towards this type of debates, by inviting people who do not necessarily share the decolonial political lens, but who have the courage to question and confront it “fairly” as I like to say. Could you tell us more about this second season? We already have several topics and themes: Does French soccer wash whiter? Is rap universal? Can we politicize treason? And so many other ideas that we will soon expose. They will share the fact to be sensitive, very rich and all crossing decolonial issues in some way or another. We will not forget to touch at topics that will be dictated by current political updates of the coming year. Paroles d’honneur claims to be a 100% autonomous media; how is the show funded? Paroles d’honneur is a pure activist product. It does not depend on any public or any obscure funding. It mostly relies on the free volunteering work of a few committed persons who dedicate a significant amount of their energy and time to move things forward consistently with their political ideals and convictions. This is a very important aspect because it demonstrates how Paroles d’honneur does not emerge from the middle of nowhere, but from the struggles from which it gets its legitimacy and its moral and intellectual integrity. However, the technical quality of our shows induces expenses. We need to pay for material, technicians, the floor manager, the sound engineer and cameramen. All of that combines into a consequent sum that we have precisely determined in the funding campaign we started a few days ago on the Kiss Kiss Bank Bank platform. We fixed a first security cap of about 13 000 euros, but that cap would only allow to fund three shows. In reality, we hope to double that sum to fully secure a full season of shows. That is why we are calling for financial support to all those who recognize themselves in the claim of decolonial politics. By that, we mean those who support it, those who love it, those who doubt it but give it legitimate existence in the media, those who wish to better know it, frame it, join it, tweak it here and there or clearly challenge it without consciously maintaining misunderstandings. Finally, we address our call for support to those who care for real debates and for a real and honorable exercise of politics. In these 19 years of the Bolivarian process, Afro-Descendant Venezuelans have been dignified in an unprecedented way in Venezuelan history. The process of social transformation with which Venezuela has experimented in the past 18 years has not only been an economical, but also a political process, where president Chavez played an essential ideological role as the leader of this humane option, of solidarity and participation. The Afro-Descendant communities of Venezuela have benefitted in ways never before seen under previous socio-political processes. Before, the land of Afro communities was in the hands of latifundistas and agrarian bourgeoisie. One the worst cases of discrimination was reflected in the Farriar municipality, where Cuban supporters of Batista, with the help of the [pre-Chavez] government, dispossessed thousands of hectares of ancestral land, including Cañizos, Palo Quemao, Farriar, Palmarejo, and El Chino. Numerous witnesses tell of how the Batista supporters hired armed bands to assault community inhabitants at night, threatening them and burning their cane crops. This lead to persecutions, and a youth was murdered when people protested these events. When Chavez arrived, on an episode of “Alo, President” filmed in Palmarejo (January 2004), he declared himself Afro-descendant, and handed over 11 thousand hectares along with agriculture credits. He decreed the land communal property of the Afro-Descendants of Yaracuy. In other words, the sacrocracia (owners of the cane growers) were expropriated in defense of the defenseless. Additionally, in the subregion of Barlovento, thousands of hectares were in the hands of the cacaocracia (cacao plantation owners) who had turned our grandfathers and grandmothers’ into hunchbacks from bending over to sow the riches of the hacienda owners. They would pay them a hundred times less what each basket of cacao was worth. Today in Barlovento we are experimenting with the socialist cacao companies and the chocolate manufacturers to work with cacao derivatives. And the six autonomous municipalities of Barlovento have voted in favor of the Bolivarian hope. In the Southern area of Maracaibo Lake (Bobures, Gibaltar, El Batey, and San Jose de Hera) people placed their faith in substantial change, in the hopes of eradicating the latifundio of the cane fields owned by the Brillemburg. This is why it doesn’t occur to us to join the guarimbas (street barricades) like they are doing in Altamira or in upper-class areas of Caracas and some inland cities. The Afro-Descendants of this country have achieved a dignity without precedent in Venezuelan history. José Chucho Garcia is an educator and founder of the “Miguel Acosta Saigne” Center for Afroamerican Studies at the Universidad Cental de Venezuela (UCV). He is also the editor of the magazine AFRICAMERICA and the author of several books. It was widely discussed on the internet. For people who have been the victim of colonialism and for civilized people in general the title and the first sentence contains a shocking insult, as is the rest of the article. Imagine an article with the title: “The case for Hitler and Nazism” and the first sentence being: “For the last 80 years, Hitler and Nazism have had a bad name. Sandew Hira has written a decolonial critique of Gilley. Read his critique here. I am Dr Francisco Dominguez, National Secretary of the Venezuela Solidarity Campaign and also Head of the Latin American Studies Research Group at Middlesex University. Below is a sketchy presentation of the Venezuela Solidarity Campaign (VSC), a UK-based organization of which I am the National Secretary. The Venezuela Solidarity Campaign was established in May 2005 in order to develop a broad based solidarity movement with the central aim of defending Venezuela’s right to self-determination and her national sovereignty, which is constantly threatened by the United States and its allies. The statement below, which is on our website, sums this up: The Venezuela Solidarity Campaign brings together a wide range of people and organisations who are against external intervention and support self-determination for Venezuela and the nations of Latin America more broadly. Within this broad coalition, people have a wide range of views with regards to political developments within the country itself. Articles on this website represent the view of the author only, unless otherwise stated. The VSC has a democratic structure with a 30-strong Executive Committee (EC) that is elected at the VSC’s Annual General Meeting by its membership. Among the EC there are national leaders of the most important trade unions, journalists, activists for the Caribbean, lawyers, student activists, and many others. About 20 of the largest trade unions in the UK are affiliated to VSC, among which there are UNITE, UNISON, GMB, CWU, etc. In fact, the 2017 AGM will take place on October 7th this year: http://www.venezuelasolidarity.co.uk/vsc-agm-2017-registration/. The VSC also seeks to tell the truth about Venezuelan developments and events primarily to drum up support for that nation’s national sovereignty and self-determination. It is also countering the intense media demonization the Bolivarian government is subjected to by informing about the myriad dimensions of social progress that has been taking place since the onset of the Bolivarian process with the coming to office of Hugo Chavez Frías in 1999. VSC produces briefings about Venezuela. Key VSC activists write informed articles about Venezuela developments and make regular appearances on TV (https://www.youtube.com/watch?v=bQx1C_5MgjA) and Radio (https://store.counterpunch.org/dr-francisco-dominguez-episode-92/). VSC publishes statements signed by the great and the good in support of Venezuela in the mainstream press. VSC activists regularly travel up and down the UK to speak at public meetings. It hold shows of videos relevant to Venezuelan contemporary reality. VSC plays a key role in the organization of the national conference of solidarity Latin America 2017 Adelante! which is normally held in Congress House at the British TUC’s HQ in London. This event normally attracts over 600 activists and deals with issues related to all the Latin American nations. Latin America Adelante! has become the biggest solidarity event with Latin America in Europe: https://latinamericaconference.wordpress.com. To spread the message VSC uses its own website (http://www.venezuelasolidarity.co.uk/), Facebook and Twitter (VSC (@VenSolidarity), video talks and other means. Below, I include a small sample of the kind of material VSC has produced in order to fulfil its commitments. Pamphlet Venezuela: how democracy and social progress are transforming a nation (http://www.venezuelasolidarity.co.uk/wp-content/uploads/2013/02/vsc-pamphlet-june-2012-free-to-download.pdf). Right Wing Majority in Venezuela’s National Assembly: The Constitutional and Political Stakes (http://www.huffingtonpost.com/dr-francisco-dominguez/right-wing-majority-in-ve_b_9069350.html). Venezuela’s Right Wing Confesses to 17 years of Political Delinquency: The Amnesty Bill (http://www.huffingtonpost.com/dr-francisco-dominguez/venezuelas-right-wing-con_b_9401644.html). Venezuela’s Rightwingers Are No ‘Beleaguered Democrats’ (https://www.morningstaronline.co.uk/a-fc5c-Venezuelas-rightwingers-are-no-beleaguered-democrats#.WcDVea2-JBw). Left Labour And Socialists Slam Media Bias Against Venezuela’s Government (https://www.morningstaronline.co.uk/a-2661-Left-Labour-and-socialists-slam-media-bias-against-Venezuelas-government#.WcDV662-JBw). And, finally a key recent briefing on the National Constituent Assembly (http://www.venezuelasolidarity.co.uk/q-a-the-national-constituent-assembly-in-venezuela/). And this on Cuba, We will keep faith with your legacy, Comandante Fidel Castro! 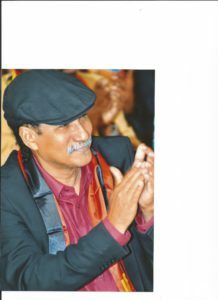 (https://www.opendemocracy.net/democraciaabierta/francisco-dominguez/we-will-keep-faith-with-your-legacy-comandante-fidel-castro-0). We think it is very important to tell the truth about Venezuela in English and we believe that it would be fruitful to collaborate and, where possible and appropriate, jointly circulate and distribute specific articles, briefings and other material that can help towards this objective in the English-speaking world. In this regard, collaboration with friends in the Caribbean is indeed important. Finally, people may be interested in the more academic material that as an academic I have published in the recent period. The Venezuela Solidarity Campaign in the United Kingdom is an English-language website that provides the latest information about the unfolding events in Venezuela. It publishes a digital magazine. The VSC wants to coordinate actions in Europe in solidarity with the Bolivarian revolution. The overrated role of refugees and newcomers in terrorism. This might come as a surprise to many, but: Terrorism in the west is not the exclusive domain of al-Qaeda, Daesh, and the like. In fact, when looking at it from a quantitative angle, an insignificant amount of terrorist attacks between 2006 and 2013 in the European Union (EU) was committed by the aforementioned groups, namely: 0.7%. The biggest threat, according to Europol, during that period came from separatist quarters. Think hereby of groups such as the IRA, ETA and PKK. An example: the Irish separatist group Dissident Republicans, also known as the “new IRA”, made one deadly victim in March 2016 when they detonated an explosive that was put under a prison keeper’s van. Another: British Labour-politician Jo Cox was killed by a right-wing extremist, Thomas Mair, in June 2016 because of her position on Brexit. A similar image can be seen in the United States (US). Figures from the FBI show that 94% of the terrorist attacks, in the period from 1980 to 2005, were committed by perpetrators that did not have an Islamic profile. A study conducted by the National Consortium for the Study of Terrorism and Responses to Terrorism concluded that between 1970 and 2011 only 7% of all attacks were committed by terrorists with a “religious conviction” (hereby referring to al-Qaeda and similar groups). The largest percentage (32%) came from groups motivated by an etho-nationalist or separatist agenda, followed by (28%) single issues parties (such as animal rights or anti-war), 22% from the extreme-left and 11% extreme-right. A famous example is the massacre committed by white nationalist Dylann Roof. The 21-year-old white supremacist unleashed his firepower on African-American churchgoers in Charleston and took nine lives. The situation changed however after 2013. In 2014 one attack was committed by a Takfiri terrorist; by 2015 it rose explosively to 17 (out of a total of 121 attacks). In 2016 it dropped slightly to 13 (of the total 142 attacks). Even though Europol reiterated in her latest report (2017) that most attacks (i.e. 99 of 142) come from separatist movements , the attacks from Takfiri quarters were very deadly. Between 2000 and 2013 40% of all deaths by terrorism in Europe were caused by Takfiri groups. The violent acts in recent years such as Brussels (2016), Nice (2016) and Paris (2015) took respectively 32, 84 and 130 lives. Their share of the deadly victims of terrorism in Europe has risen in 2016 to include almost all (i.e. 135 victims out of a total of 142). More on this below. In conclusion: Takfiri terrorist attacks are clearly very lethal, but not the only danger. Extreme-right, separatist and ethonationalist groups constitute also a major threat. This commonly heard statement is supported by a study conducted by sociologist Sean Darling-Hammond. 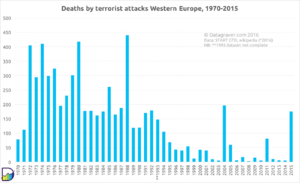 The researcher collected data from each of the 300 reported terrorist attacks in November 2015 and compared the number of articles devoted to the violent acts. Darling-Hammond observed 392 articles dedicated to the terrorist attack in Baghdad; 1.292 to Beirut and more than 21.000 on the violence in Paris. The researcher concluded that Western victims disproportionately receive more attention than their fellow victims in the non-western world. The underreporting doesn’t only feed into and sustains indifference of violence inflicted upon the Global South, but also obscures the real impact of terrorism on the non-western world. The top three consists of Muslim-majority countries. The first western country on the list is the US at # 7. 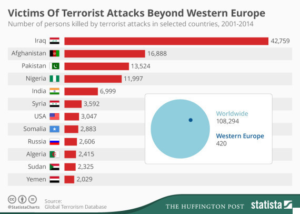 When 9/11 is taken out of the equation, no single western country remains in the top ten. Even the total deaths by Daesh in the west wouldn’t earn a top ten spot (443 victims). According to the 2017 ICCT-report, 395 Western citizens died because of terrorist attacks by Daesh from June 2014 to June 2017. I’ve added the Manchester-attack (22 civilians killed), the following London-attack (8 killed), Catalonia attacks (16 killed) and Turku (2 killed). 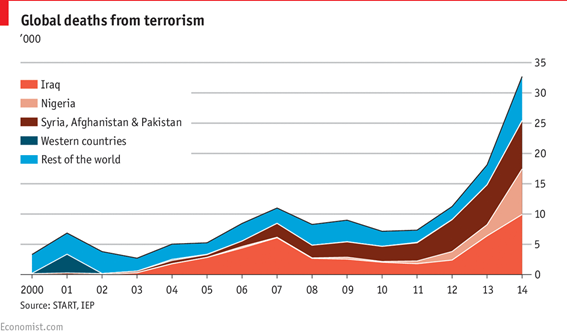 Terrorist violence thus is mostly felt in the non-western world. Take Iraq. The US invaded the Arab country in 2003 for two reasons: 1) The then leader, Saddam Hussein, was thought to have chemical weapons in his possession and 2) that he was providing shelter for al Qaeda – both claims turned out to be unfounded. However, the consequences of the invasion were very real: eleven years after the illegal invasion, in 2014, more Iraqi’s became victims of terrorist violence than the total world number (!) In 2001 – that is, the year in which 9/11 happened and ignited the US-led Global War on Terror. Iraq – where no suicide bombings were registered before 2003 – has been completely destabilized by the illegal invasion and more than 40,000 casualties by terrorist violence have been recorded ever since. The next question that then arises: why are these figures missing out in the public discourse? According to intellectual Noam Chomsky this is not just due to a lack of media-attention, but because of a political culture wherein victims are differentiated between worthiness – i.e. worthy and unworthy victims. Chomsky explains his thesis with the following example: in 2007, a poll was conducted among US citizens asked to estimate the total number of deaths in Iraq. The median was 10,000. The actual number then was between 150,000 and 650,000 deadly victims. According to Chomsky, the disparity is a consequence of a targeted campaign by the US: they aim to suppress media reporting on (deadly) civilian victims caused by their occupation of Iraq. The purpose is to diminish its role in and prevent a discussion of their occupation of Iraq. And when are civilian casualties considered ‘worthy’ enough according to Chomsky? That’s when their deaths can further Washington’s foreign policy. This was demonstrated in 2014 when the former US president, Barack Obama, used the threat of Daesh to get “boots on the ground” in Iraq. In 2011, then President Nouri al-Maliki refused to extend the stay of the US Army. That led to dissatisfaction and resistance in Washington who preferred not to leave. When Daesh came on the Western radar in 2014 and threatened civilians worldwide, that danger was used as a pretext to increase the number of US troops in Iraq. The (potential) victims of Daesh were in this context seen as ‘worthy victims’ because they could help Washington’s regional agenda. The figures above clearly show that there were significantly less fatal victims in the period after 9/11 than in the 21 years before. That trend began after the fall of the Berlin Wall (1989) and has continued ever since except for outliers like Madrid (2004), London (2005) and Paris (2015). In conclusion, terrorist attacks before 9/11, especially in the 70s and 80s, exceeded today’s level of activity. Violent incidents have overall been on the decline since 9/11. Moreover, the impression that most deadly attacks occur in the Western-Europe cannot be supported by the actual distribution of violent incidents; that burden falls on the eastern part. The Charleston-attack – whereby a neo-Nazi linked extremist weaponized his car to plow into a group of anti-fascist demonstrators and thereby killing one woman and injuring many others – is one of many examples in the recent history demonstrating an increasing threat coming from the extreme-right. Indeed, a recent study has shown that 1/3 of all so-called lone-wolf terrorists in Europe are linked to the extreme right. Research from the US shows that far right extremists are even of a greater threat than Takfiri terrorism. Think-tank New America found out that nearly two times more casualties have fallen, between 9/11 and 2015, by hands of white supremacists than by Takfiri terrorists. This study is supported by a recent investigation (2017) held by the United States Supreme Audit Office – a.k.a. the Government Accountability Office (GAO). The GOA concludes from their survey that the extreme right is responsible for the bulk of all fatal terrorist attacks: 73% versus 27% by Takfiri terrorism. In the Netherlands a terrorist attack was committed in a mosque by a group of five extreme right-wing racists in 2016. In early 2017, an extreme-right terrorist attacked a mosque in Canada Quebec. The perpetrator shot on worshippers as they were praying and killed 6 civilians. In short, this select overview makes clear that extreme right-wing terror is not only in the march but a phenomena to be seen throughout the West. A persistent myth spread (but not exclusively) by the (extreme) right is that the inflow of migrants and refugees leads to more terrorist violence. Studies, however, show that the role of migrants and refugees in terrorist attacks have been exaggerated. The ICCT, a research institute in The Hague (Holland), investigated all of Daesh’ linked terrorist attacks in the west and found out that 73% of all attackers were citizens of the same country where they committed their act of violence. 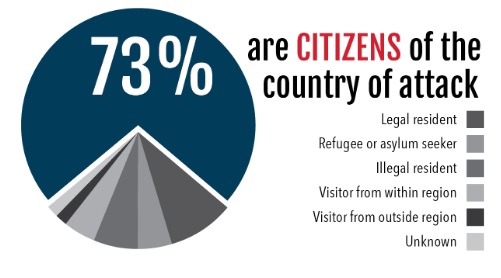 Another 14% were visitors or residents with a (legal) residence status. A further 6% remained in the country without documentation and only 5% were refugees or newcomers (see below). The vast majority of the danger (95%) comes from citizens or residents without a recent history of migration. The findings from the ICCT report (2017) is broadly shared by other similar studies. British think-tank The Henry Jack Society (2017) found out that, in the case of Great Britain, more than two thirds of the attacks since 2005 were done by individuals “who were either born or raised in the UK”. In an another research by The New America Foundation “every jihadist who conducted a lethal attack inside the United States since 9/11 was a citizen or legal resident“. This study is corroborated by a recent research conducted under the guidance of political scientist Robert Pape. They found out (2017) that there were zero refugees involved in the 112 Daesh-related crimes. Lastly, liberal think-tank Cato concluded that the role of immigrants and refugees in terrorist attacks is minimal. Virtually all dead whereby immigrants or newcomers were involved come from one single event: 9/11 (98.6%). Apart from that, fatal terrorist attacks by immigrants or refugees are extremely rare in the United States. However, with recent attacks such as Berlin (2016), Ansbach (2016) and Copenhagen (2016), the proportion of newcomers in attacks has significantly increased. According to the ICCT (2017), the influx of refugees and migrants is not the problem per se, because “the number of criminals and terrorists in mass migration movements has been low” and “terrorists often have a criminal background to begin with”. Moreover, Daesh focuses its operations primarily on the conflict in their home territories in Iraq and Syria; newcomers and immigrants are fleeing those places because they are against the terrorist groups. The researchers of the ICCT therefore argue that the focus should be on proper regulation of the inflow of newcomers. Secondly, as Brookings Institute scientist Daniel L. Byman argues, the problem are not the immigrants or refugees, but to them in coming contact with local radicalization-hubs. Indeed, we see that clearly in the case of the 22-year-old Syrian newcomer, Jaber al Bakr, who was arrested on October 2016 on grounds of planning to commit a terrorist attack. Jaber al-Bakr arrived in Germany in February 2015 and received legal residence five months later. According to Al-Bakr’s brother, Alaa al-Bakr, Jabr was not politically active or interested in Germany before arriving there. That changed after. In Berlin, Jabr al-Bakr came into contact with extremists. A local imam is thought to have brought him into contact with and urged him to fight for Daesh in Raqqa (Syria). In September 2015, Bakr left Germany from Syria through Turkey, where he spent about five months and then two in Syria. On his personal Facebook page, it appears that al-Bakr began to sympathize with Daesh from January 2016. About two months before Jabr wanted to commit his violence, he was arrested by the German authorities. He could be detained because another Syrian newcomer arrested and handed him over to the police (after which the suspect, Jabr al-Bakr, hung himself later in his cell). To conclude, the vast majority of Daesh terrorists are citizens of the same country in which they have committed their violent act. Only a small number of IS-affiliated terrorists are newcomers or undocumented citizens. If then there the goal is to stop or reduce terrorism, more attention should be paid to local radicalized groups rather than border surveillance.